You must be a member of the Abu Dhabi DinnerNations Group to attend this activity. Would you like to join this group? 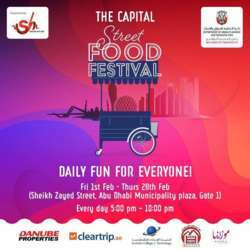 Abu Dhabi City Municipality and in collaboration with Show House Production presents “The Capital Street Food Festival” Fun for Everyone.. Outdoor Cinema, live entertainment, games, special offers, kids sports activities, street food and much more.